Pat's first quilt sighting was in 1976. She saw the beauty and comfort of handmade quilts that her husband Gregg's grandmother made. His grandmother was a quilter who made scrappy pieced and tied quilts for her family. It was these utility quilts that gave Pat her very first taste of quilting. At that time, Pat was still using her degree in computer science working in the computer industry. 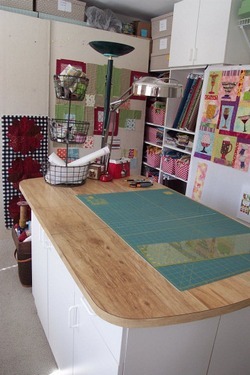 “During my free time, I began taking as many quilting classes as I could and I joined a guild. My second attempt in quilting was different than my first and all of my other crafting experiences because I had fallen in love with fiber all over again.” As time passed, Pat became more and more active in this quilting community that she had grown so fond of. Pat’s evening hours and weekends became consumed by her quilting passion. 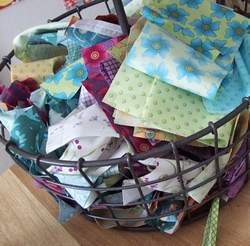 She started out creating quilted items to sell at craft shows and bazaars. Her regularity as a customer and developing quilt making skills got her involved with local quilt shops, where she soon began making store models and teaching quilting classes. Because she was a “computer person”, Pat was using the Internet early on. Contacts made on the web put her in touch with various fabric manufacturers, which lead her to making quilt models for them. “In 1997, I left my job as a computer programmer to put all of my effort into quilting. I had been a programmer for twenty years and it was no longer fulfilling. The stuff that I did outside of the office filled my soul. I found that I could be happier and a more excited person in life if I could create all of the time. Designing patterns came naturally to me, I’ve always been a doodler and when I used patterns I always modified them in some way.” It wasn’t until Pat quit programming, that she designed her own pattern from scratch. Words and good old-fashioned brainstorming stimulate Pat’s design process, “I begin a design by selecting a theme or idea and writing down related words to help get more ideas. For example, if I am working on a holiday themed project, I would just begin writing down words that come to mind such as: tree, snowflakes, Christmas magic and so on. When I see all of the words together on paper, I am inspired to design. I usually begin on paper and eventually go to the computer. Doing quick sketches first usually gets my brain warmed up. I teach a Folk Art Design workshop and we do an exercise like that to get started. We come up with ideas as a group and I draw a design up on the board. Once we establish a design, then I’ll teach it using a hand or machine appliqué technique.” Pat describes her teaching style as “casual” and her prime goal is to give each person a lot of attention. “I want each student to do what works for them personally. 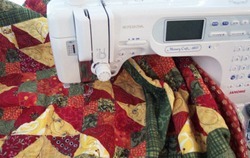 There shouldn’t be anything un-fun about quilting, I'm upbeat and help my students get past any quilting problems they may be having,” Pat explained. In addition to designing individual patterns, Pat has written 6 quilting books and has two more in the works. Generally, Pat writes two different types of quilting books—pattern oriented books or technique instruction books. Her latest book, Learn to Appliqué with Pat Sloan was quite the experience. Leisure Arts actually had Pat teach a class for their staff. She had already written the text and created the projects for the book prior to the class but the entire first section of the book was put together by one of her Leisure Arts students and all of the photography happened during the teaching of this class. Pat’s newest design adventure is her second fabric collection, Brambleberry Farm for P&B Textiles. Pat’s approach to designing fabric is no different than the way she designs quilt patterns—the use of words, “Words help to get me started and guide me through my design process. I’m a city girl and I’ve never lived on a farm. Brambleberry Farm lives in my imagination only.” City girl or not, Pat does love to garden and the focal print of this collection was inspired by the buzzing bees, vines and berries that live in her garden in Herndon, Virginia. The rest of her collection was designed to be companion prints to the focal, with small and medium scales designs, a checkerboard and a stripe. Pat created her Berry Leaves print to look like a real pile of leaves that you would find in your garden. It features leaf on top of leaf, layered with varied textures. This garden inspired collection is a delightful fusion of Pat’s whimsical folk art style in a range of hues to please the tastes of many. Find Pat Sloan's books on ConnectingThreads.com.